The clouds and fog are hanging so low and the rain so heavy that we can barely see in front of us. We blindly follow the GPS on our rental car up the single winding mountain road that leads to Sant’Agata Feltria, navigating hairpin turns and precarious drops on both sides. With the same focus and tenacity as foraging pigs, my husband and I are on the hunt for white truffles (tartufi bianci). This small medieval village is the home of the National White Truffle Fair held every Sunday in October. Sant’Agata Feltria also houses the oldest wooden theatre in Italy and an 11th century walled castle that make the town look like the setting for a fairytale. When we heard that the smell of truffles literally wafts through the air, we didn’t think twice about making the trip, only some 45 km. (about 27 miles) from our hotel in Rimini. 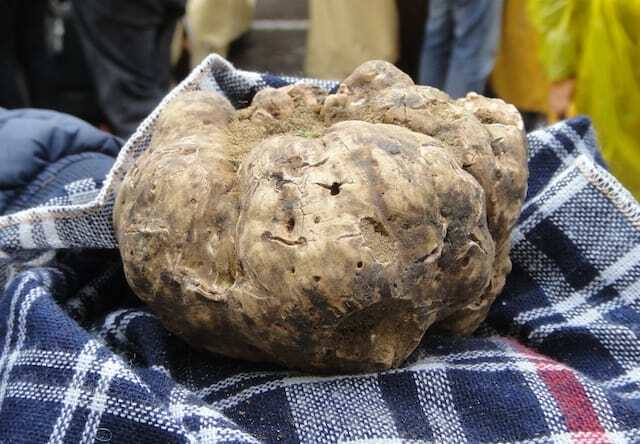 Most people associate white truffles with Alba in Piedmont, where a legendary trade fair is held each autumn. Compared to that, this one is less commercial and more like a country fair. The cobblestone streets are lined with small booths, at which farmers and artisans proudly display truffles, mushrooms, chestnuts, cheeses, honey, wines, and handicrafts. Fairgoers huddle around each tantalizing booth, often tasting before they buy. Everyone is warm and welcoming. However, the main event here is the white truffle. It dominates the landscape in every form known to man: fresh and in oils, pastes, purees, butters, vinegars, grappa and salts. The only thing missing is nasal spray! In the small town square, the butcher’s case is filled with truffled meats; the cheese store has hard and soft cheese with truffle; the bakery showcases truffled rolls. A new truffle shop sells them fresh from a refrigerated case that resembles a jeweler’s safe. The festival has been in continuous operation for 27 years, overseen by a committee of pro-loco (grassroots) and private interests. Each year, judges select the truffle that is best in show, based on quality and size. The 2010 winner weighed in at a whopping 580 grams (more than a pound, with a value estimated at $2500-4000). The population of about 2500 people “mushrooms” on these Sundays, as the town packs in 30,000 – 50,000 visitors. An enormous tent is set up for lunch, seating 600 people at a time at long tables with yellow-checkered tablecloths. Four local restaurants operate serving stations, each offering a variety of tempting plates for less than $10 (with reasonably priced local wines extra). Unable to choose, we opt for three dishes: tagliatelle al tartufo, risotto al tartufo, and gnocchi ai funghi – the memories of which still linger. Just as the sky begins to clear after lunch, we stroll on one of the paths leading to the castle. Throwing caution to the wind, we succumb to our appetites again, pausing to taste some warm, freshly made bomboloni (pastries made from fried dough with custard filling) at another stand. This post was part of a photo essay blog carnival sponsored by Monika Fuchs. Click here to watch an interesting Bloomberg video about the Truffle Lady of New York. I was so glad to visit Sant’Agata on my recent trip. How fun it would be to be there in white truffle season, but we were thrilled to partake of fresh black truffles. We even went truffle-hunting (they use dogs, surprisingly)! I think we both have to figure a way to go back! Me to participate in the hunt; you to sample white truffles!